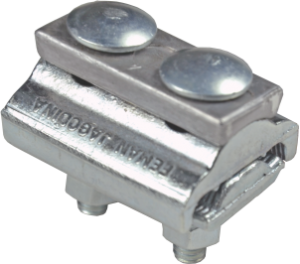 Feman Fix clamp is used for connecting and terminating aluminum- steel lines at all connection points where exceptional connection strength is needed, in accordance with JUS N.F4.106.Convenient for quick assembly and disassembly since only one wrench is needed; no need for a counter wrench. 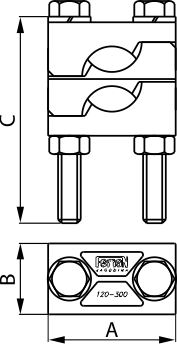 Grooves add 48 additional strength to the connection. 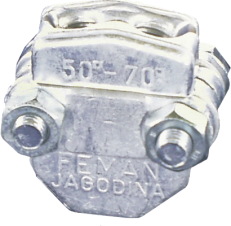 Used for connecting tap-off and connecting Al cables to uninsulated aerial wires, in accordance with JUS.N.F4.106. 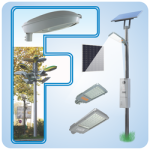 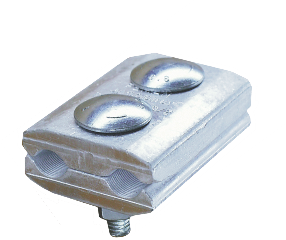 In addition to good mechanical features, it has exceptionally good electrical characteristics. 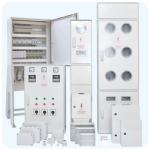 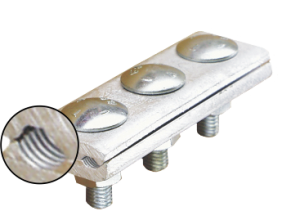 It is made of electrotechnical aluminum according to DIN 40501. 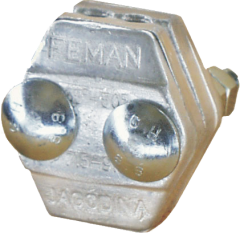 FEMAN’s “UNIMAX” clamp is made by casting under pressure and the channels are made with cross grooves which, when tightened, destroy aluminum-oxide on the surface of the cable, creating better electrical contact. 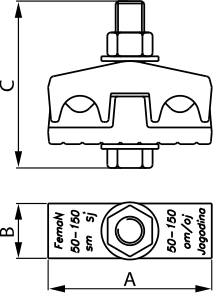 At the same time, this innovation also improves the clamp’s mechanical characteristics. 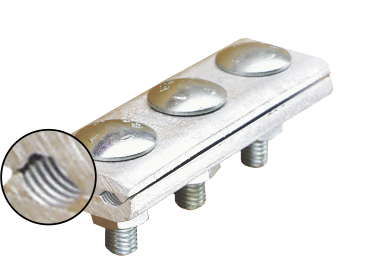 The quality and reliability of the connection has been greatly improved with the introduction of the cross grooves along the length of the channels. 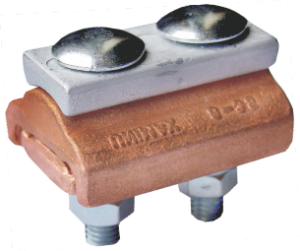 Until now, unimax clamps were made of Al profile without grooves, and the layer of aluminum oxide caused greater transient resistance between the clamp and the cable, causing poor tap-off wire contact. 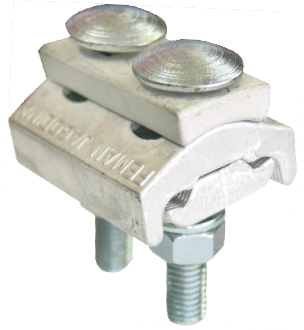 The two parts of this clamp are held together by two bolts which are impressed into the bridge of the clamp, allowing for easier single wrench assembly. 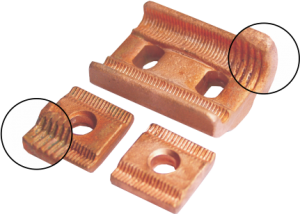 Used as extension and termination clamps for all joints where great mechanical strength is needed in compliance with JUS N.F4.106. 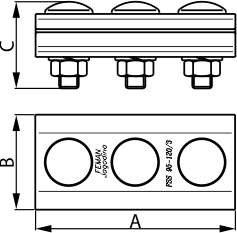 Made in three sizes for lines of diameters 25-35, 50-70 and 95-120. 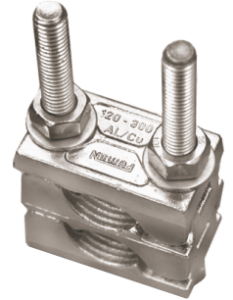 For Al and Al- steel they are made of forged aluminum alloy. 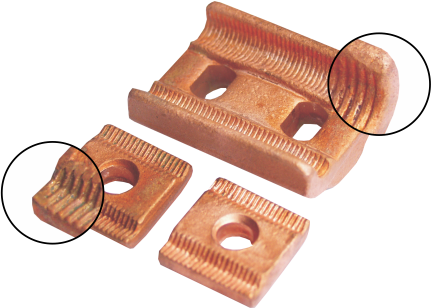 For Cu lines, they are made of 99,9% forged copper. 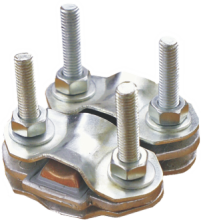 These clamps consist of two separate parts; upper and a lower. 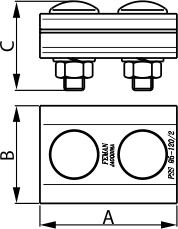 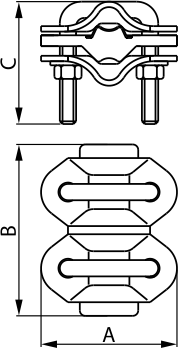 By putting the two parts together, channels are created A which bite into the lines of the appropritate diameter and secure them. 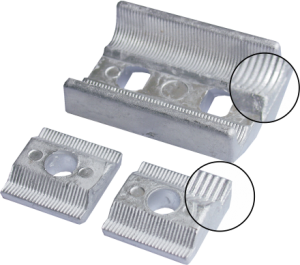 The channels are made with cross grooves to prevent slipping of the line under normal loads. 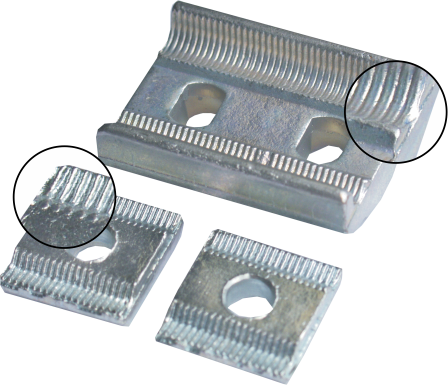 Joining the parts of the clamp is done with two bolts which are well protected from corrosion. 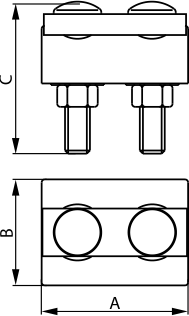 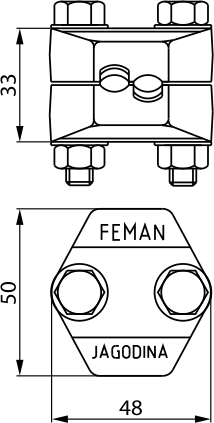 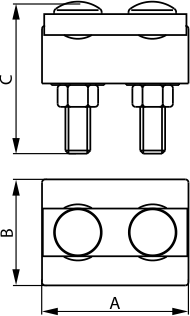 It is secured with a counter screw-nut.FEMAN’s termination clamp should satisfy normally allowed strain on the line. 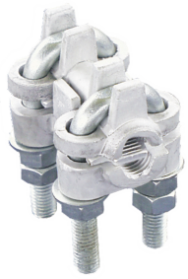 If increased mechanical strain is expected, use two or more clamps for the connection. 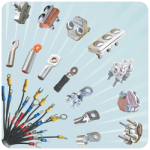 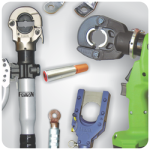 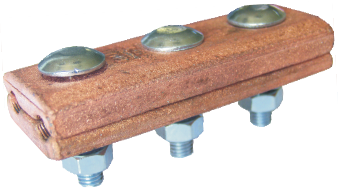 FEMAN clamps are manufactured with materials and technology that guarnatees that they will not crack or break. 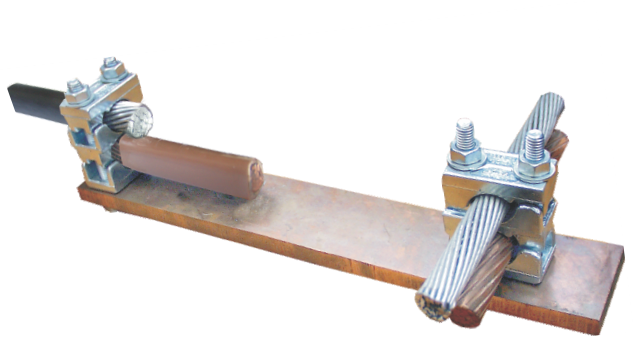 Used for connecting aluminum and copper wires and switching from aluminum to copper wire, in accordance with JUS N.F4.106. 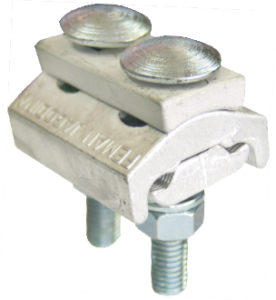 NOTE : In place of this clamp we recommend using our universal SUPER UNIMAX clamp. 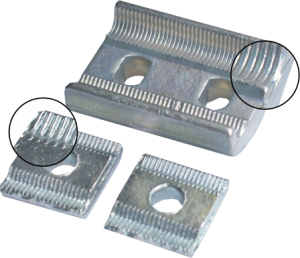 This type of serrated camp is used for current bearing connection that needs to withstand a mechanical strain on the cable, in accordance with JUS N.F4.106. 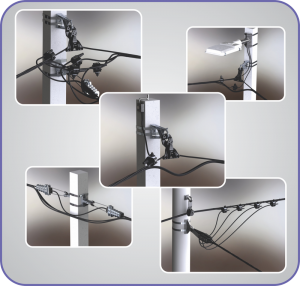 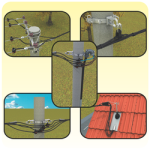 They are also suitable for branching the network and securing additional lines to the main line. 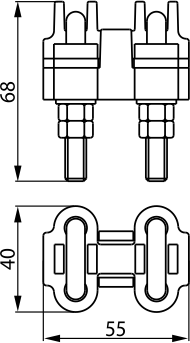 Suitable for connecting cables of the same or differing diameters from 50-70 mm2. 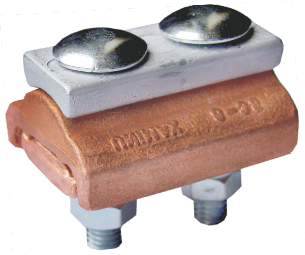 These clamps are made of aluminum alloy and thus are suitable for joining Al and Al-steel lines. 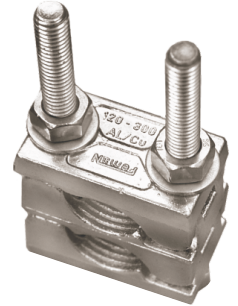 A very strong connection is achieved by the use of a stirrup bolt, secured with a counter nut (two nuts). 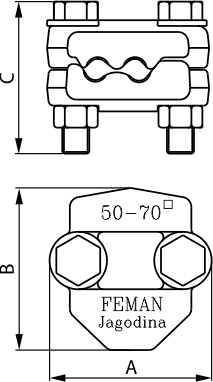 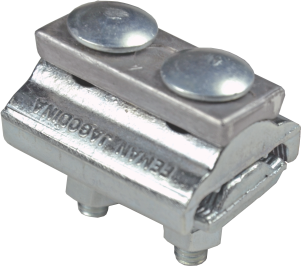 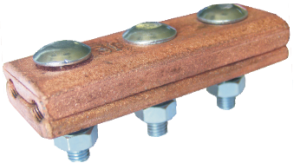 Used for connecting cables onto flat, rail type, level conductors in accordance with JUS N.F4.106. 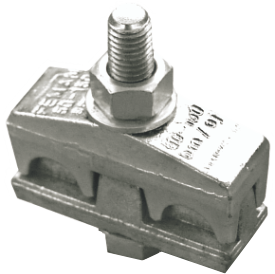 Made of specially forged brass alloy galvanized by zinc-coating, allowing the connection of aluminum and copper cables at the same time.Double clamps are suitable for serial connections, one above the other (up to four cables). 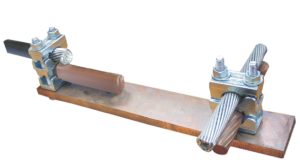 Used for extending wires in uninsulated above ground and cable networks. 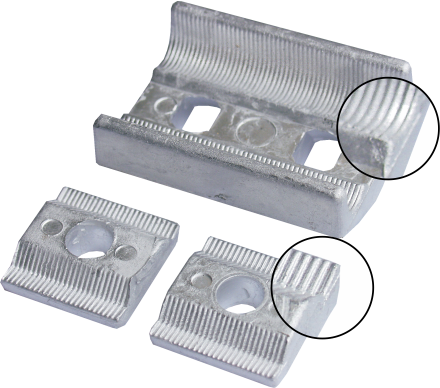 With their construction they secure a good electrical and mechanical joint. 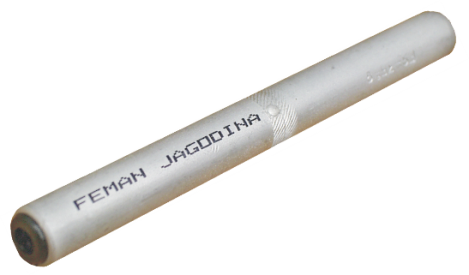 Connection is made using hexogonal crimping using”FEMAN” manual crimpers (FP-185, FRP-300). 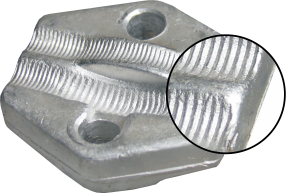 When joining insulated wires it is necessary after crimping to insulate the joint location. 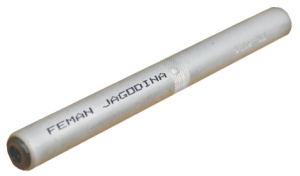 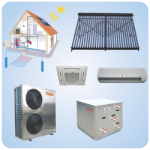 Insulation is most often done with heat-shrink tubes or self-adhesive insulating tapes.